In response to my 2014 Grape Expectations post, Mike from pleasebringmemywine.com sent a tweet, outlining his plan to try a new wine every week in 2014 and asked for a suggestion to kick it off. I responded without giving it a great deal of thought (suggesting an Aussie Riesling with a Chinese takeaway) but then I began to get very excited about the idea. I thought it would be great to get involved; maybe we could drink the same wines and compare notes. 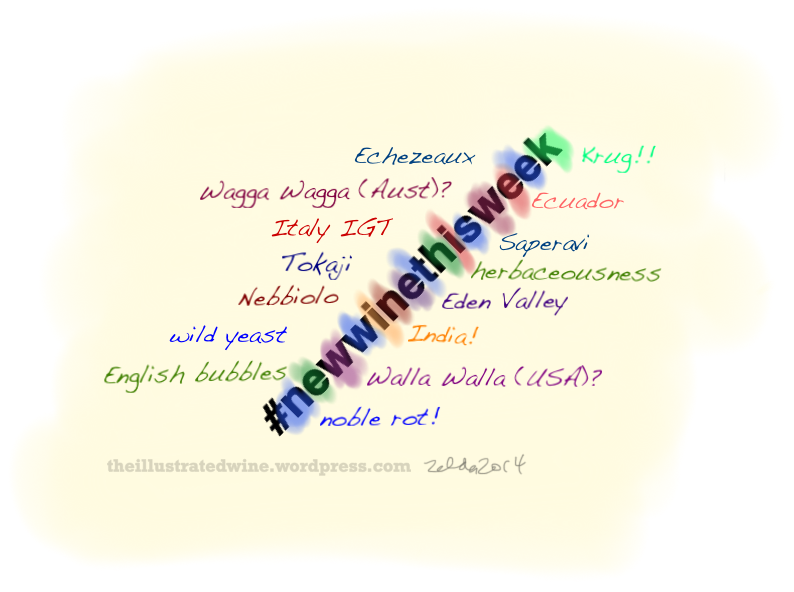 However, after a few direct messages and emails, we came up with the idea for the #newwinethisweek. To make things even better, Zelda from theillustratedwine.wordpress.com, even came up with a fantastic design for the campaign! I hope this sounds like something of interest – if it is then sign up and get your friends and family on-board; let’s learn about new wines together in 2014. 43 Week 42 Alcohol free Anywhere! No votes! Looks like fun. I’m in! No wine in grocery stores in Minnesota, though! Feel free to spread the word in the US… become a #newwinethisweek crusader! I am so late to this but must say I love the idea! Will your selections be available in the US at a major wine retailer as well? I’d love to join in the fun as I am able. Thank you! Please feel free to add some US recommendations each week! We usually post the week’s wine on a Monday but are running a day late this week… It’s proving to be great fun and very educational!